Most people are familiar with maple syrup production- it is a time honored tradition throughout eastern North America and has seen a resurgence in popularity over the past decade. Though it is not well known, all species of walnut (Juglans spp.) also produce a sweet sap that can be boiled down into valuable syrup. There is a well-established resource of black walnut (Juglans nigra) trees throughout eastern North America that could be utilized for syrup production to complement existing sugaring operations. Tapping walnut trees is a relatively new phenomenon and very little information exists on the optimum tapping time for these species, the expected yields from traditional bucket or more modern vacuum-enhanced tubing systems, and the overall economic outlook for producing walnut syrup. Although the number of tappable black walnuts is significantly less than the number of tappable maples, there are excellent opportunities for sugarmakers to utilize the trees they currently have while also planting these trees for long-term benefits. They grow extremely fast and are relatively easy to establish in open fields and along watercourses as riparian buffers. Most people currently plant walnut trees for their timber value and nut production, however syrup production could be one more attribute to add to the list. A tubing system installed at a walnut grove in Syracuse. More research is necessary to determine the impact of collecting walnut sap under high-vacuum conditions. Photo by Michael Farrell. species is not yet fully known. Furthermore, none of the previous studies were done with high-vacuum tubing and there isn’t yet any reliable data on what one can expect from tapping black walnuts. Since vacuum tubing can produce 2-3 times the amount of sap as gravity flow in maples, we need to know if there is a way of using vacuum to get more sap flow out of walnuts. 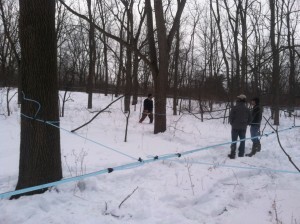 With a grant from the Towards Sustainability Fund at Cornell, we conducted research on black walnut sugaring in 2014. In order to determine potential yields from black walnuts, we collected sap at four sites in New York, Pennsylvania, and Indiana during the winter of 2014. In New York, we tapped 58 trees using individual bags and 5/16 spouts on Cornell’s campus in Ithaca and 96 trees using vacuum tubing at Lemoyne College in Syracuse. A sap puller diaphragm vacuum pump was utilized at this site with an average reading at the pump of 18” Hg. Jacob Noonan served as a research collaborator and tapped 35 trees on buckets with 5/16 spouts in Erie, PA. Rich Hines also tapped 10 trees with 7/16 spouts and buckets in Indiana. Whereas most of the trees were tapped in mid-February for all sites, Hines tapped his trees on November 19 to explore the possibility of sap flow in autumn. At all locations, every time sap was collected (usually every 4-7 days), the total volume and sugar content of the sap was measured and recorded. At the end of the season, all of the data was analyzed and normalized to equate to oz of syrup produced, following the “Rule of 87.1” commonly used in the maple industry. The highest yielding site (Erie PA) produced an equivalent of 11 oz of syrup per tap whereas the lowest performer (Syracuse) yielded only 6 oz of syrup per tap. For comparison purposes, maples usually yield between 32 and 64 oz of syrup per tap. In a similar manner to maple sap flow, sap sugar content was very low in the Fall (less than 1%) and much higher in the spring (2-3.5%). The highest reading taken was 6.2% and there were many trees producing sap in the 4-5% sap sugar concentration range. A blend of maple and walnut syrups sold at Cornell’s Uihlein Forest in Lake Placid. At $5 each for a 40 ml bottle, the retail price equates to approximately $500/gallon. Photo by Nancie Battaglia. assumptions based on one year of data. 2014 was also very cold throughout March and soils were deeply frozen due to a lack of snow cover, which could explain part of the reduced yields. However, this study suggests that it is unlikely that walnut trees will ever produce similar quantities of sap as maples, even in a good year. Though it was surprising that the vacuum tubing system produced the lowest quantities of sap, this was only a preliminary study without any replicated trials. Thus, future research should explore sap yields under vacuum at additional sites over the course of several years before any conclusions can be made regarding the effect of artificial vacuum on walnut sap flow. Another aspect of walnut syrup production that requires further attention is the large quantities of pectin found naturally occurring in the sap. Pectin can make filtering the sap and syrup extremely difficult and time consuming, clogging filters much more rapidly than the sugar sand often found in maple syrup. There seems to be tremendous variation in the amount of pectin produced between individual trees and sites as well as the time of the year that the sap was collected. We did some initial experimentation with using pectinase, an enzyme that is designed to break down the pectin. Our initial trials were not extensive enough to come to any conclusions on the efficacy of pectinase, but given the problems associated with filtering and the prevalence of pectinase in so many other food processing industries, this idea deserves further attention. It’s also worth noting that if you want to make walnut jelly instead of syrup, that would be much easier! As a final note, if you are already producing maple syrup and have walnut trees, I would recommend doing some experimentation on blends of maple and walnut syrup. Maple-walnut is a popular ice cream flavor here in the northeast and most people have heard of it. Of course most maple-walnut varieties use English walnuts and imitation maple flavor, so a maple-walnut syrup made from the saps of these species is nothing like the ice cream flavor. 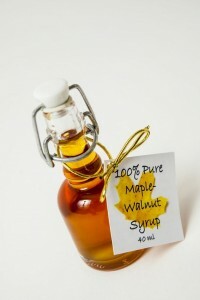 However, because walnut syrup tastes surprising similar to maple syrup (with a bit of a nuttier flavor), blending the two syrups creates a value-added product that can stretch your small amount of walnut syrup further. We’ve done that with most of the walnut syrup we produced at Cornell and customer feedback has been tremendous. If you are already producing walnut syrup or are considering doing it in the future, we would love to hear from you. Feel free to call Michael Farrell, Director of The Uihlein Forest at Cornell University, at (518) 523 9337 or send a note to mlf36@cornell.edu with any questions or comments. Pectin! THAT’S why I’m getting so much goop instead of syrup! Can you provide some more details about the results of the enzyme? This site might be able to give you more info! In addition, you could also contact the author of this article, Michael Farrell, directly with your question at (518) 523 9337 or mlf36@cornell.edu. Clogged 5 cheesecloth filters making walnut syrup yesterday in NE TN. If anybody out there has successfully tapped a hickory tree, I would like to know some details. Although there’s not much information on the internet about it, you should be able to make walnut jelly pretty easily due to the high naturally occurring levels of pectin in walnut syrup. Does this answer your question? We just tapped a group of black walnut trees on or property. This is our first year tapping anything. We are very interested to see what happens. We are in central/southern Indiana. Thanks for this information! I’m excited to see what happens out here. Hi all. Got over 50 taps out on hard maples, been home sugarin for about 20 years. Just tapped about 10 walnuts today, first time and was thrilled to see a run already. I’ve tried sycamore, hack berry, and hickory with no luck, but have not pursued them. I’m concerned about the pectin, filtering, etc. If anyone has food info on Hector filter I’d appreciate. Just started tapping walnuts in addition to maples. Linwood, any info I’ve tracked about hickory sirup always leads back to the shag bark boiled and sugar added. I’ve tried to tap hickories, never got a run. Same with sycamores and hackberries. Definitely had walnut sap flowing today when I tapped. Looking forward to some walnut sirup! If anyone has more info on filtering I’d appreciate it. This video series, featuring the author of the article, might be able to give you more information about filtering. Hope this helps! 1. I have tapped and made syrup from a sycamore. Did not run great, but it ran. 2. Pectin – made some white walnut syrup last week and tried beermakers pectic enzyme. I DOES eventually dissolve out the pectin once formed. Better practice is probably to put PE in sap for about 12 hours near room temp before boil down. I’m in my second year of tapping, collecting and syruping black walnut trees. I haven’t really had much issue with pectin so far. I think it may increase later in the season as I do remember getting some jelling last year. The syrup from the earlier run of black walnut I like best as it lacks a tangyness that seems to develop later in the season. The sugar content in my walnuts is much lower than sugar maple judging by what my hydrometer reads as well as the amount of sap required to make syrup. My average readings are in the .75% range. I also tap box elder and it runs about 1%. My trees are in bottomland and perhaps that contributes to a lower sugar reading. I’ve put taps in sycamore, hickory and birch too but so far very little flow compared to the black walnut and box elder. Lynwood…I’d love to hear about your sycamore syrup. Your the first person I’ve come across who has actually made it. Any idea of the sap to sugar ratio? What did the syrup taste like? Thanks for any info you can provide. One week ago I tapped 10 large (14-20 inch) Black Walnuts on my property in Northwest Illinois. The temps last week ranged from 40-65F in the daytimes and 28-35F during nights. I’ve collected 3 gallons and 1 quart thus far and anticipate another couple of gallons by end of this week. I’m going to add 5 drops per gallon of pectinase to the sap before boiling which should reduce the gelling issue. I just tapped 10 large black walnut trees (northern Catskills in NY) and in a day received about a gallon of sap, which tastes like slightly flavored water (indescernable taste). I’ve decided to test run the one gallon with 5 drops of pectinase on a slow cook on my wood stove. Really curious how this goes! Thanks everyone for all the posts, comments, and info! Same sycamore I tapped several years ago has not run a drop so far and maple flow is down so much we pulled the taps. I messed around with tapping some black walnuts last year. This year I have 25 taps out and have made 45-(40ml) bottles. Been a lot of fun and it tastes great. I found that after taking the sap off the evaporator and before putting it on the stove to finish it, I run it through an orlon filter twice, and then once more right before its finished. Results in nice clear syrup. We are tapping black walnut again this year, has anyone had trouble with the thick bark and the taps’ length? I generally have to scrape the outer bark down to the inner bark with a hatchet before drilling and tapping. Question- can the resulting pectin be used? As I was straining it out and throwing it away it was occurring to me that make pectin from apples, maybe this is two birds with one stone? Anyone have any advice on ratio of Pectin Enzyme to Gall. of Black Walnut Sap? I have been considering tapping the very large black walnut trees (24″+ diameter) that are on my property in Skaneateles (Onondaga County) NY for a few years and this year have gone and done it. Sap production has been good in the last 10 days and from 7 trees most with 3 taps I have collected over 15 gallons of sap. My first few (2 gallon) batches were done on the kitchen stove (I have a vent to outdoors) and boil down time was in excess of 4 hours each. Syrup produced was wonderfully buttery and nutty and very different from maple. Naturally the amount of syrup is minimal and dependent on how “thick” (concentrated/sweet) I reduced it to. This has been more of a “science” activity for me and my grand kids so quantity of finished syrup isn’t that important. Yesterday we collected 7 gallons and I am now boiling it down outside using a borrowed turkey fryer burner. I had to do frequent additions once boiling and now am about 50% reduced. My early “test” batches were reduced down to 4 degrees above initial boiling temp for the first batch and 7 degrees for the second. The 4 degree batch was sweet enough but not as thick as the 7 degree one. I am aiming for 5 or 6 degrees today which will give good flavor and decent viscosity. I am likely to do maybe one more major cook down on the weekend and then untap and plug the trees so they can get on with spring. I finished the major reduction outside on the “turkey fryer” burner and ended up with a little over two quarts of darkening sweet sap which I transferred into another pot and brought inside to do the final reduction on the stove. It only took about another 45 minutes (on low flame) to raise the sugar content enough to take the temp about 4.5 degrees (F) above initial boiling temp – which for me is 212F – it finished around 217F and my final yield came to about 40 ounces of very tasty dark amber black walnut syrup. I expect to collect and process another batch on the weekend. I’m new to tapping and tapped 20 black walnut trees in Bucks County, PA. About 6 are giving me sap and nothing from the others. Anyone know why? I’ve collected about 20 gallons of sap so far and I froze in containers in my freezer so that I can boil it down all at once. Is that OK to do? Some places it said I could others said no. I’ve successfully made black walnut syrup this year and the taste was great. I also did maple syrup. With the maple I made some maple sugar to be used for various recipes. Worked great. Tried it with walnut and I couldn’t get sugar. Cooking it simply turned it darker to a thick “candy”. I’ve heard of walnut sugar. Anyone know how to make it. No sap from hickory trees get extract from te bark ad sugar and simmer to the thickness you want.Walnut syrup is made same a maple syrup. Can tap Norway maples, Box Elders Scymore and birch trees (100) gal to gallon of syrup.Any maple tree will make syrup. I have concluded my third year of 100% black walnut syrup production. Due to surplus, I applied to sell it via my registered home kitchen in Durham, NY. I was told ONLY maple and honey is allowed to be sold via home kitchens and I would need to cook my sap and bottle in a commercial kitchen if I am to sell it. It’s the same as maple, except for the pectinaise (sp?) I use during my slow boil. The dept of agriculture and markets told me they have no scientific reason why maple is the only syrup allowed, and I am reaching out to see if you know of a reason (other than maple syrup politics). I really want to put it into the markets (especially farmers markets), but my hands are tied. I’d recommend getting in touch with Michael Farrell, the author of this article and the Director of The Uihlein Forest at Cornell. He might have some good insight for you. He can be reached at (518) 523 9337 or by email at mlf36@cornell.edu. Hope this helps! Tapped 5 Black Walnuts(10 taps) this past February(first time)and got about 10 gallons of sap over 3 weeks, boiled to 218 degrees, tastes way better than maple according to my family, filtered same as my maple syrup but had to squeeze it through the final filter after finished it yielded 1 and a half pints. Thank you for sharing your success with the walnut syrup! Second year tapping black walnut trees. Last year I made around a gallon of black walnut syrup from 7 trees. I figured out I had two more so this year I have 9 trees tapped. The smaller trees 12″ to 16″ will produce from a dribble to 3 or more gallons of sap per day. The bigger trees 20″ and up will produce 4 to 5 gallons in a 24 hour period. These are very tall trees. I would estimate they are 70 to 80 feet to the first branch. Last year I had no problem with pectin. I didn’t even know they had pectin. This year I have had nothing but problems and just determined it was due to pectin. It may be associated with nut production as last year we had very few nuts but the syrup was great. This year we had a lot of nuts but there is a ton of pectin. The walnut syrup is great the walnut jelly while actually tasting OK is not really my thing so going to have to try some of my pectic enzymes I use in wine. Not unusual at all to get 10 to 20 gallons of sap per day. I tap a few Sugar Maples but I’d like to try Walnut and maybe Sycamore, Hickory Birch… To do that, I would have to go to friends and neighbors. Can anyone tell me how tapping a tree might effect the lumber value of the tree. Could it damage the wood as far as a timber buyer is concerned? Thanks. This CCE publication about maple, sap, and syrup may be helpful to answer your question about the effects of tapping. I would also refer your question to the author of this article, Michael Farrell. Micheal is the Director of The Uihlein Forest at Cornell and can be reached at (518) 523 9337 or by email at mlf36@cornell.edu. Hope this helps! Thanks for the response Anna. I had some trouble with the CCE link but I’ll try the contact info you sent me.I’m sure it will help. Geesh, I made Black walnut syrup in 2003 and called you folks up in Cornell. Even sent a sample and never heard back. I tapped black walnuts along a creek bottom and near springs. got a fair flow. Never noticed any pectin. But did not know to look for it. We used closed tubes into closed collection containers and never filtered it. Why would anyone tap a black walnut tree?? You are completely destroying its timber value. Black walnut is the most valued timber in North America. If any of you ever want to sell your standing black walnut trees you should never tap them. Just because a tree can survive being tapped and live a long life doesn’t mean that the lumber will still have value. You would not believe how much fungus and bugs get into those little tap holes. This can change the lumber in a very dramatic way. If you never want to sell your walnut timber then tap away. But keep in mind that just a few dozen nice mature walnut trees that are 20″ in diameter and over can be sold to a logging company for close to (and in many cases over) $10,000. To each their own I guess but I will stick to maple tapping. Just my two cents. Enjoy the flow while it lasts. Thanks for sharing this article. I have 3, 40 year old Black Walnuts and a 75 year old. I tapped 3 of them this year as a trial. It went very well. I was able to produce 16oz of syrup per tap (gravity flow). I boiled down to about 15% of volume then used a coffee filter to remove the pectin. It is going to be hard using maple syrup after tasting this stuff!